Praise be to Allah. May Allah. accept all our righteous words and deeds, and help us to be sincere in secret and in public. The Muslim starts his day with suhoor before Fajr prayer. It is better to delay suhoor until the latest possible time of the night. Then after that the Muslim gets ready for Fajr prayer before the adhaan. So he does wudoo’ at home and goes out to the masjid before the adhaan. 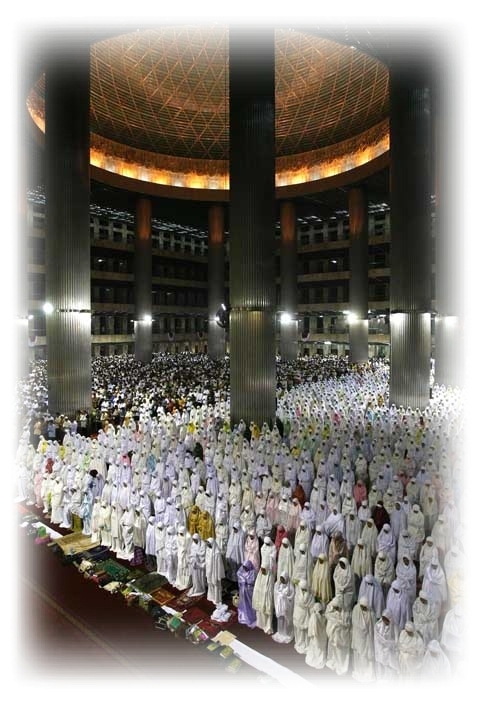 When he enters the masjid, he prays two rak’ahs (tahiyyat al-masjid – greeting the mosque). Then he sits and keeps busy making du’aa’, or reading Qur’aan, or reciting dhikr, until the muezzin gives the call to prayer. He repeats what the muezzin says, and says the du’aa’ narrated from the Prophet (peace and blessings of Allah. be upon him) to be said after the adhaan ends. Then after that he prays two rak’ahs (the regular Sunnah of Fajr), then he occupies himself with du’aa’ and reading Qur’aan until the iqaamah for prayer is given. He is in a state of prayer so long as he is waiting for the prayer. After offering the prayer in congregation, he recites the dhikrs that are prescribed following the salaam at the end of the prayer. After that if he wants to sit in the mosque until the sun has risen, reciting dhikr and reading Qur’aan, that is preferable, and that is what the Prophet (peace and blessings of Allah. be upon him) used to do after Fajr prayer. Then about one-quarter of an hour after the sun has risen, if he wants he can pray Duha prayer (a minimum of two rak’ahs), and that is good. Or if he wants he can delay it until the preferred time, which is when the day has grown hotter and the sun is higher in the sky – that is better. Then if he wants he may sleep to prepare himself for going to work, and he can intend by sleeping to strengthen himself for worship and earning a living, so that he will be rewarded for it in sha Allah. He should also follow the etiquette of sleep that is prescribed in sharee’ah, both actions and words. Then he goes to work, and when the time for Zuhr prayer comes, he goes to the masjid early, before the adhaan or immediately after it, and he should get ready to pray beforehand. So he prays four rak’ahs with two tasleems (the regular Sunnah before Zuhr), then he keeps busy reading Qur’aan until the iqaamah for prayer is given, and he prays with the congregation, then he prays two rak’ahs (the regular Sunnah after Zuhr). Then after the prayer he goes and finishes whatever of his work is left, until it is time to leave work. If there is a long time to go after finishing his work until the time for ‘Asr prayer, then he can rest. But if there is not enough time and he fears that if he sleeps he will miss ‘Asr prayer, then he should keep busy doing something suitable until the time for ‘Asr comes, such as going to the market to buy some things that his family needs and the like, or going straight to the mosque when he has finished his work, and staying in the mosque until he has prayed ‘Asr. Then after ‘As, it depends on his circumstances. If he can stay in the masjid and keep busy reading Qur’aan, this is a great opportunity. But if he feels tired, then he should rest at this time so that he will be ready to pray taraaweeh at night. Before the adhaan for Maghrib, he should get ready to break his fast, and he should do something at this time that will benefit him, whether reading Qur’aan, making du’aa’, or having a useful conversation with his wife and children. One of the best things that he can do at this time is to take part in offering iftaar to those who are fasting, whether by bringing food to them or helping to distribute it to them and organizing that. This brings a great joy which no one knows except those who have experienced it. After iftaar, he goes and prays in congregation in the masjid, and after the prayer he prays two rak'ahs (the regular Sunnah of Maghrib). Then he goes back home and eats whatever is available – without eating too much. Then he looks for a suitable way for himself and his family to spend this time, whether reading a book of stories, or a book on practical rulings, or a quiz, or permissible conversation, or any other useful idea that is of interest to the members of the family and will distracts them from the haraam things that appear in the media which regard this as their prime time, so you find the media transmitting their most attractive programs at that time, that may contain immoral and obscene material. Strive to turn away from that, and fear Allah. with regard to your “flock” (i.e., your family) concerning whom you will be questioned on the Day of Resurrection, so be prepared to answer the questions. Then get ready for ‘Isha’ prayer, go to the mosque and keep busy reading Qur’aan or listening to the lesson being given in the masjid. Then after that perform ‘Isha’ prayer, then pray two rak’ahs (the regular Sunnah of ‘Isha’), then pray taraaweeh behind the imam with humility and focus, pondering the meanings of what is recited. Do not finish until the imam finishes. “Whoever stands (and prays) with the imam until he finishes, it will be recorded as if he spent the night in prayer.” Narrated by Abu Dawood, 1370, and others. Classed as saheeh by al-Albaani in Salaat al-Taraaweeh, p. 15. Keeping away from all haraam things and whatever may lead to them. Paying attention to ensuring that your family avoid falling into any haraam thing or whatever may lead to that, in a wise manner, such as preparing a program just for them, or taking them out for leisure trips to permissible places, or keeping them away from bad friends, or looking for good friends for them. Keeping busy with things that take priority. Then you should try to sleep early, whilst paying attention to the etiquette of sleep as prescribed in sharee’ah, both actions and words. If you read some Qur’aan or some beneficial books before going to sleep, that is something good, especially if you have not yet completed your daily portion of Qur’aan – so do not go to sleep until you have completed it. Then wake up before suhoor, allowing enough time to recite du’aa’, because this time – the last third of the night – is the time when Allah. descends, and Allah. has praised those who seek His forgiveness at this time, and has promised those who call upon Him at this time that He will answer them, and that He will accept the repentance of those who repent to Him at this time. So do not neglect this great opportunity. Coming early to Jumu’ah prayer. Staying in the mosque after ‘Asr prayer, and keeping busy with reading Qur’aan and making du’aa’ until the last hour of this day, for that is a time when du’aa’s are answered. Make this day an opportunity for completing some of your deeds that you did not finish during the week, such as completing your weekly portion of Qur’aan, or finishing reading a book or listening to a tape and other good deeds. The last ten days of Ramadan include Laylat al-Qadr which is better than a thousand months. Hence it is prescribed for a person to observe i’tikaaf (“retreat” for the purpose of worship) in the masjid during these ten days, as the Prophet (peace and blessings of Allah. be upon him) used to do, seeking Laylat al-Qadr. Whoever can observe i’tikaaf at this time, this is a great blessing from Allah. Whoever cannot observe i’tikaaf for the entire period should do as much as he is able to. If he is not able to do i’tikaaf at all, then he should try to spend the nights in worship. Praying qiyaam, reading Qur’aan, remembering Allah. and making du’aa’. He should prepare for that by resting during the day so that he will be able to stay up at night. This program is just a suggestion. It is a flexible schedule that each person can adapt to his own circumstances. This program pays attention to the Sunnahs that are proven from the Prophet (peace and blessings of Allah. be upon him). It does not mean that everything mentioned here is an obligatory duty, rather it includes many things that are Sunnah and mustahabb. The most beloved of actions to Allah. are those which are continuous even if they are little. At the beginning of the month a person may be keen to do acts of worship, then he may slow down. Beware of that, and strive to persist in all the actions that you do in this blessed month. The Muslim should strive to organize his time in this blessed month so that he will not miss out on a great opportunity to do more good and righteous deeds. For example, a person should try to buy all the things that the family needs before the month begins, and he should buy day-to-day needs at times when the stores are not crowded, and visits to friends and family should be organized in such a way that they do not distract from acts of worship. Make doing lots of acts of worship and drawing closer to Allah. your priority in this blessed month. Resolve at the beginning of the month to go to the masjid early at the times of prayer, and to complete the Book of Allah., and to regularly pray qiyaam al-layl in this great month, and to spend (in charity) what you can of your wealth. Read the verses correctly. The way to do that is to have your reading corrected by someone who knows how to read well. If you cannot do that, then by listening to tapes of expert readers. Revise what Allah. has enabled you to memorize, and memorize some more. Read the tafseer (commentary) on the verses, either by looking up the verses you do not understand in reliable books of tafseer such as Tafseer Ibn Katheer , or by making a program to read a book of tafseer. Start first with the thirtieth Juz’ (section) of the Qur’aan, then move on to the twenty-ninth juz’, and so on. Strive to apply the commands that you read in the Book of Allah. We ask Allah. to perfect for us the blessing of Ramadan, and to help us fast and pray qiyaam throughout the whole month, and to accept (these acts of worship) from us, and to forgive us for our shortcomings.